Classical music enthusiasts are invited to Christ the King Episcopal Church’s upcoming concert on Sunday, March 3 at 3 p.m. 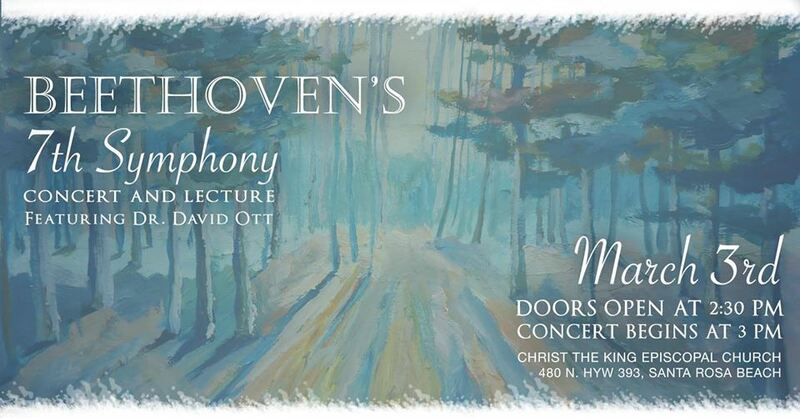 Conductor Dr. David Ott will present a concert and lecture based on Beethoven’s 7th Symphony. When the sanctuary at Christ the King Episcopal Church was built, it was designed to create wonderful acoustics that would support live music. Each year, the church hosts a series of choral and orchestral programs throughout the fall and spring. The current season will conclude with the March 3 concert. The upcoming concert is expected to be the highlight of the current season. The program is built entirely around Beethoven’s 7th Symphony, and conductor David Ott will lead a 25-piece orchestra. Between movements, Ott will enlighten the audience with stories about what Beethoven was going through at that time in his life. The symphony is a deeply profound work completed in 1812 when Beethoven’s hearing had declined to the point of near deafness. He had withdrawn from society and found refuge in nature. The highly rhythmic essense of the music reflects Beethoven’s love of the countryside and the country folk. In spite of his deafness, the symphony is a testament to joy. Attendees are urged to arrive early. Doors will open at 2:30 p.m., and the concert will begin at 3 p.m. All the concerts at Christ the King are free of charge and open to the public thanks to the generous support from patrons and church offerings. Christ the King Episcopal Church is located at 480 North County Highway 393 in Santa Rosa Beach. For more information, call 850-267-3332.